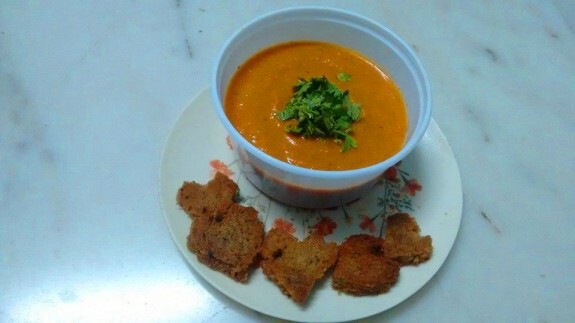 Make this reddish yummy and tasty tomato soup with ripe and juicy tomatoes and make your day. 1. First, prepare your vegetables to make vegetable stock. Cut the carrots into small cubes. Chopped onions, ½ tsp chopped garlic, chopped 1 celery stick and keep everything aside. 2. Now, heat water in a large heavy based pan and add carrots, half portion of onions, half portion of garlic, chopped celery stick, 2 Tbsp olive oil, salt as required and black pepper powder. Stir them continuously and keep everything boiling until the water comes into half of the portion. 3. When you will get the smell of the vegetables from water, remove it from heat and make it little cool. 4. Drain the vegetables from the water and keep both of them aside. Your vegetable stock (water) is ready. 1. Rinse the tomatoes well and keep aside. 2. Take enough water in a pan so that the tomatoes will immersed into it completely. 3. Add 1 tsp salt and bring water into boil. 4. Add tomatoes into it and switch off the flame. Cover the pan with lid. Let tomatoes immersed into it for 15-20 mins. 5. In the mean time, make a smooth paste with corn starch and water. 6. Drain the tomatoes now and let them become cool. Peel the tomatoes and remove the eyes of the tomatoes. 7. Directly chopped the tomatoes on the blender jar so that juices will directly drop into the jar. Add the vegetables which keep aside from the vegetable stock into the jar. 8. Blend the tomatoes and the vegetables into a smooth paste. 9. Now, take a pan and melt butter. Add rest of the garlic and sauté it for few seconds. 10. Add rest of the chopped onions and sauté it for few seconds. 11. Now, add the tomato and vegetable puree. Saute it properly. 12. Now, add the vegetable stock, black pepper powder and salt as required. 13. Let the soup come to a gentle boil on lo flame. 14. Now add sugar and stir it again. Now, add the corn starch paste into it and stir it on the soup. 15. Now, pour the tomato soup again on the jar and blend it once again. 16. Pour it into the pan again. Now when serve, heat it again and serve it hot with bread croutons. 17. You can garnish tomato soup with chopped coriander leaves on top middle of the soup in a bowl. 1. Take the white or brown bread slices and cut into small heart shaped. 2. Place the pieces in a pan and toast the pieces on low flame until brown and crisp from both sides of all the pieces. 3. Serve it with hot tomato soup.